juice | Keep It Up, David! 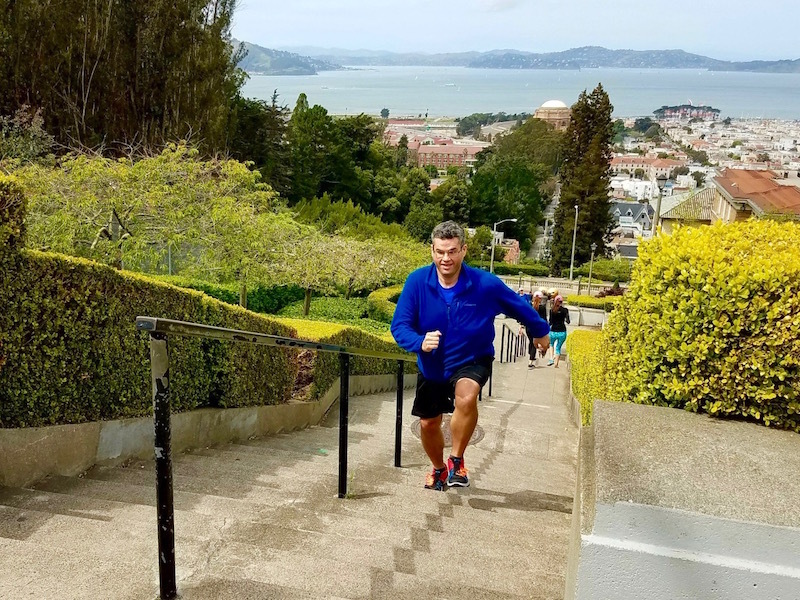 Competing in the San Francisco Fight For Air Climb was certainly a highlight of last weekend, but the weekend had lots of fun stuff – and the stairs at 101 California weren’t even the only stairs I climbed! So I have bad news and I have good news. The bad news is that Randi Marie Simpson failed to come forward to claim the Edible Arrangements fresh fruit bouquet that she won yesterday. As I explained when I announced the contest, and again when the winner’s name was announced, the winner has 24 hours to email me to claim their prize. Unfortunately, Randi didn’t email me – and I checked my Spam folder and everything. Same rules apply: This post went live at 7:15pm PST on Saturday, April 28th, and you have 24 hours (until 7:15pm PST on Sunday, April 29th) to send me an email at keepitupdavid@gmail.com to claim your prize. Remember how, when you left the winning comment, you had to provide an email address? You gotta email me from that address (which I can see but no one else can) so I know it’s you and not an imposter! I’m tired of picking winners. Georgina, come claim your prize!!! I’ve never been a huge smoothie person. I’ve enjoyed them occasionally, but it rarely crosses my mind to make my own smoothies in my own kitchen. That might be starting to change. And I have frozen fruit to blame thank. A few weeks ago, I came across strawberries at a ridiculous prize: $1.25 for a one-pound container. I spent $5 and bought four – I couldn’t pass it up! Unfortunately for me, it was one day after a big visit to another supermarket, and I was already loaded up on fruit. So I washed and hulled all 4 pounds of strawberries, put them in a big container, and froze ’em. Earlier in the week, it occurred to me that the strawberries would make a great base for a smoothie. They’d both flavor and chill the smoothie at the same time, and I do love when fruit is capable of multitasking. So I made a smoothie. And I enjoyed it. Yesterday, I made another smoothie. And I jotted down what I used to make it, so I could share with you. There are a bazillion smoothie recipes out there, and I didn’t look at a single one. I pulled out all my fruits and vegetables and tossed a bunch of stuff in, including a few things that probably have no right being in a smoothie. But that’s the joy of smoothies (and why I call mine Kitchen Sink Smoothies): You can throw pretty much anything in there, and add enough fruit, and it’ll taste great! I have a hunch I’ll never make a smoothie the same way twice. I started with about 1/4 cup skim milk. Then I added a handful of frozen strawberries, and a handful of frozen grapes (which taste awesome frozen; they’re a great snack all by themselves). Then I went through my veggies to see what was closest to going bad. I settled on 3 roma tomatoes and a zucchini. I roughly chopped ’em up, and added them in. And, just to bulk it up with veggies a little further, I added 2 baby eggplant and a radish (I thought the heat might be a nice touch). Then I added more sweetness by throwing a pear and kiwi into the mix. The end result, as shown above, wasn’t sickly sweet. It was perfect. Couldn’t taste the zucchini or eggplant (the two items I was most skeptical about), and because of all the veggies, I didn’t worry about it being a huge calorie bomb, like some smoothies can be (especially at juice bars). 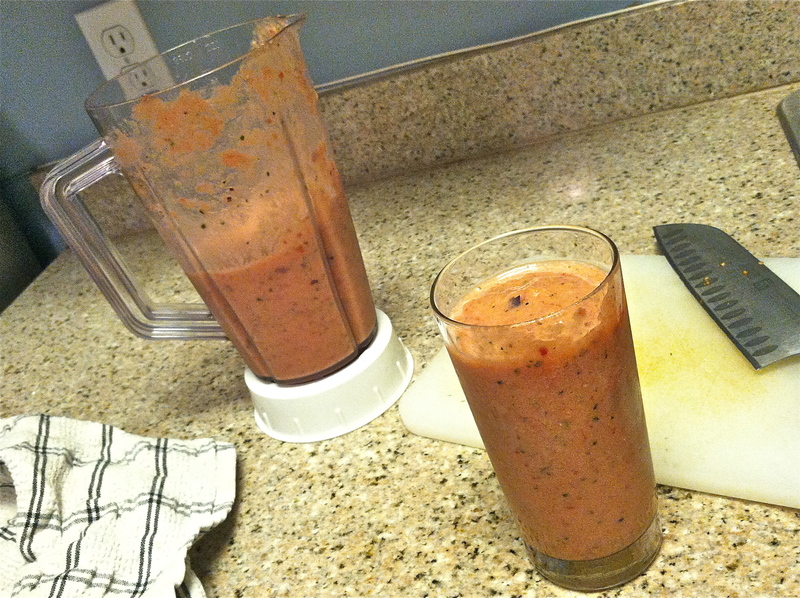 It ended up being a lot of smoothie, too – I was drinking smoothie for half the day, without any guilt at all! I’m already thinking about what I can use in my next smoothie.